While IWC does offer dress, sports, and dive watches, they are most famous for their aviation timepieces. 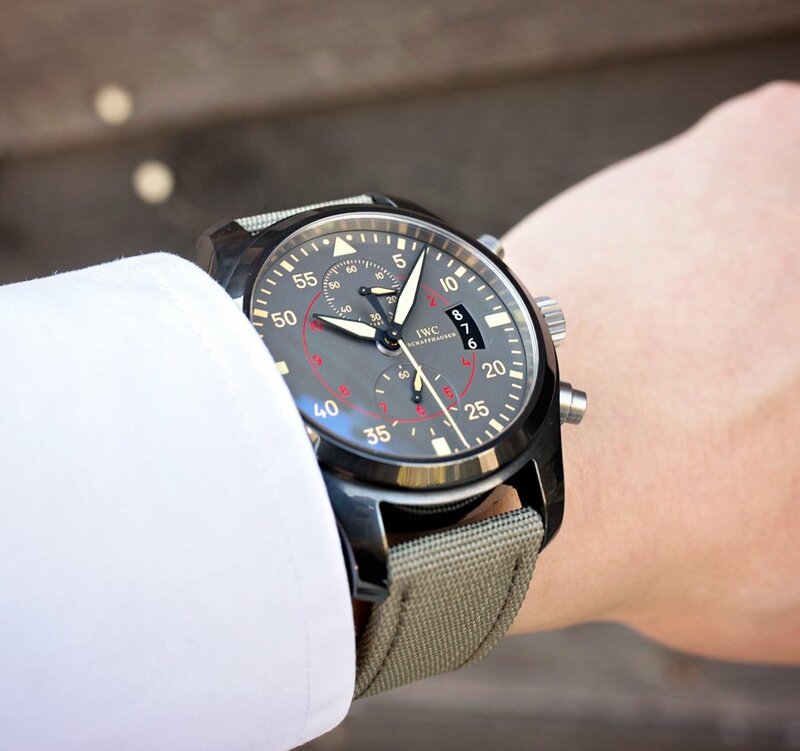 The IWC Pilot’s Watches collection houses a slew of different styles including this particular Top Gun Miramar. Whether the inspiration for the IWC Top Gun is the actual Navy Fighter Weapons School or the 80s classic movie, is up to the wearer. But I’ll bet most will choose the former over the latter. A watch originally reserved for the Navy Fighter Weapons School. Founded in 1969 at the Naval Air Station Miramar in California, the United States Navy Fighter Weapons School taught advanced fighter pilot techniques. More commonly know as “Topgun”, the school and its students later became the focus of the Tom Cruise movie of the same name, Top Gun (1989). 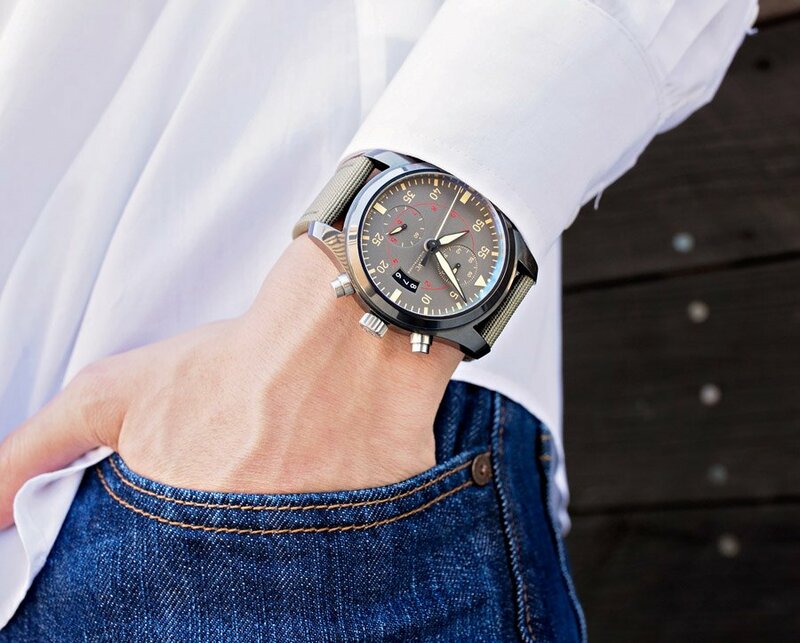 One look at the IWC Pilot’s Watch Chronograph Top Gun Miramar and it’s easy to imagine Maverick, Iceman, or Goose sporting a watch like that on the job. With that, let’s take a closer look. This Top Gun Miramar chronograph (ref. IW388002) made its debut at Baselworld 2012. True to its name, the aesthetics of this particular IWC Pilot’s Watch recall the jumpsuits of Top Gun students. The khaki, sand, olive, black, and red tones work well together without going overboard. Despite the many colors of this watch they blend in together. On the anthracite dial we first notice the indexes on the outer perimeter. The 5-minute markers sit alongside rectangular indexes at 3, 6, and 9, in addition to an inverted triangle at 12. This is followed by an hour indicator ring in red—clearly recalling vintage aviator watches. Next up we have the two sub-dials: the flyback chronograph and the small seconds counter. And finally, there’s the date window which indicates yesterday, today, and tomorrow. It sounds like a lot, but it’s just right. It’s also worth noting that the lume on the hands and select indexes are done in a color reminiscent of the patina of vintage watches. 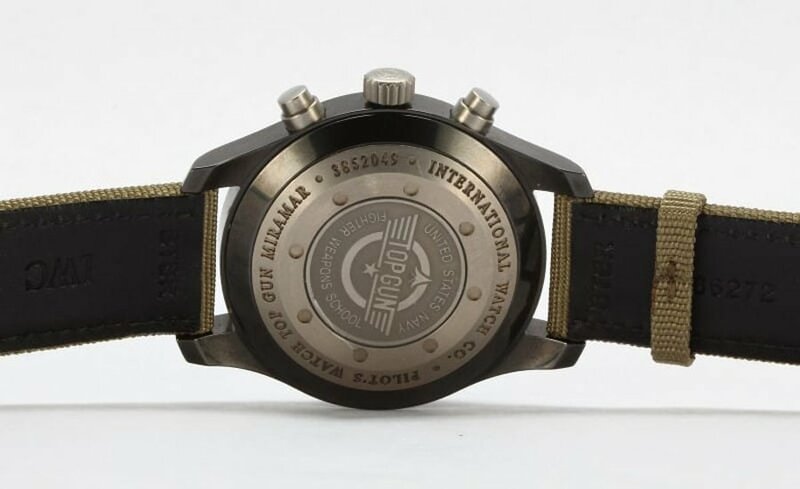 The engravings on the Top Gun Miramar reads “INTERNATIONAL WATCH CO.” and “PILOT’S WATCH TOP GUN MIRAMAR”. The large 46mm case is constructed in ceramic and titanium—where the titanium is used on the caseback, chrono pushers, and crown. The caseback includes the Top Gun engraving in case anyone missed the watch’s inspiration. Additionally, the convex sapphire crystal gives the watch an even larger presence. The Top Gun Miramar chronograph is a very large watch, but not obscene. The engine, so to speak, of the IWC Pilot’s Watch Chronograph Top Gun Miramar is the Caliber 89365. This is an IWC in-house automatic chronograph movement that was brand new when this Top Gun model came out. The Caliber 89365 operates at 28,800 bph (4 Hz) and offers a very practical 68 hours of power reserve. It also has the flyback chronograph function. This means the wearer can reset the chronograph without stopping it first. This IWC movement also has the hacking seconds function, where the seconds hand comes to a stop when the winding crown is out for more accurate time adjustment. With a 68-power reserve, this watch will stay “alive” for a long time. 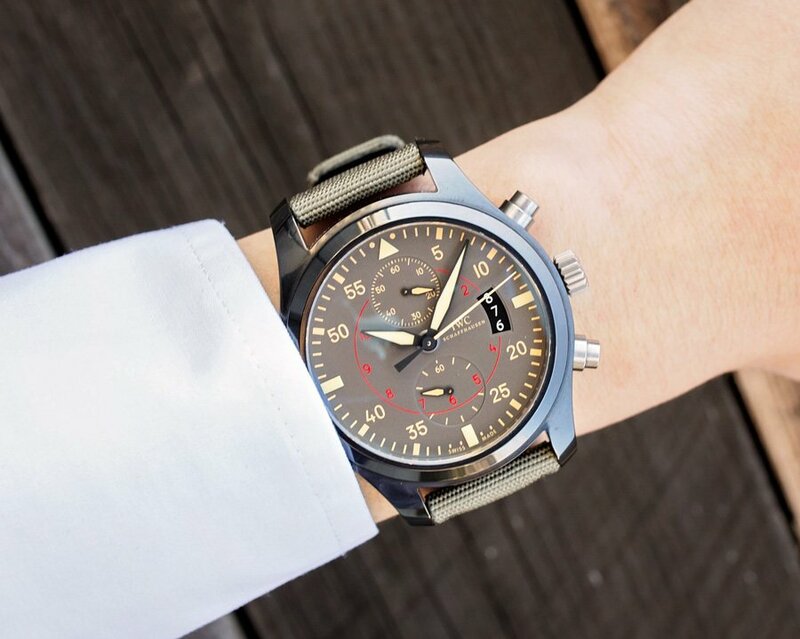 Cool, casual, and rugged, the IWC Pilot’s Watch Chronograph Top Gun Miramar is a solid aviation model. While the watch may not be to everyone’s taste, just like the Topgun school, it’s really only reserved for a select few.